—Proud Marine parents wearing official EGA Shop recruit battalion t-shirts at their Marine's graduation. (Images used with permission). Click here to order EGA Shop Exclusive Recruit Battalion T-shirts! Family and friends are strongly encouraged to attend the graduation events to celebrate their recruit's having earned the title of United States Marine. Thursday is Family Day and Friday is Graduation Day. The Marine Corps will have activities planned for both days. There is no limit to the number of family members and friends that can attend Family Day or Graduation. You'll want to arrive at the Depot early to avoid long lines at the gate. Dress is casual but please remember that this is an important time in your Marine's life and you do not want to put him in an uncomfortable position with his command and fellow Marines, so dress accordingly. Comfortable walking shoes are suggested for both days. On Family Day, you'll learn what to do and what not to do during your time at MCRDSD before being led to the Motivational Run, where you'll get your first glimpse of your new Marine! 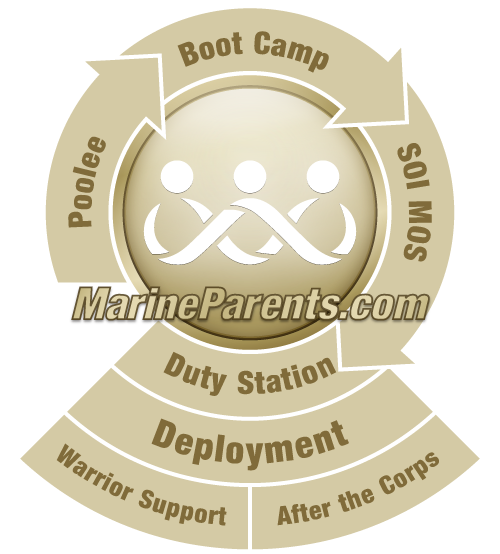 Following the Liberty Formation, your new Marine will have Depot Liberty and be able to spend time with you. Graduation Day includes the Color Ceremony, an optional event where you will see the raising of the flags and enjoy hearing the Marine Band, and the Graduation Ceremony, which is the culmination of your new Marine's time at boot camp and the beginning of a new stage of his or her career. Important Note: Due to some holiday schedules, a handful of recruit classes might graduate on a Wednesday, with family day on Tuesday. The same schedule will apply, just substitute Tuesday for Thursday and Wednesday for Friday in the schedule provided on this page. Changes in the levels of security alerts could alter scheduled events. Maps of the Depot and a schedule of events will be provided to you on Family Day. Time-off from training for graduating Marines. Recruits must remain on the Depot during Liberty. From 12:00 noon until 5:00 p.m. on Family Day for the recruit to visit with family and friends. Hours: 9:00 a.m.–7:00 p.m. Monday–Saturday, 10:00 a.m.–6:00 p.m. Sunday. Hours: 6:00 a.m.–9:00 p.m. Monday–Friday, 8:00 a.m.–9:00 p.m. Saturday & Sunday. Hours: 10:00 a.m.–7:00 p.m. Monday–Saturday, 10:00 a.m.–5:00 p.m. Sunday. Hours: 9:00 a.m.–7:00 p.m., Monday–Saturday, 10:00 a.m.–6:00 p.m. Sunday. Hours: 6:30 a.m.–5:30 p.m. Monday–Friday, 9:00 a.m.–5:00 p.m. Saturday, closed Sunday. Hours: 7:00 a.m.–3:00 p.m. Monday–Friday. Breakfast: 6:00 a.m.–9:00 a.m. Thursday, 6:30 a.m.–9:00 a.m. Friday. Lunch: 11:00 a.m.–4:00 p.m. Thursday, 11:00 a.m.–3:00 p.m. Friday. Hours: 10:30 a.m.–1:30 p.m. Mondays–Wednesdays and Fridays. Hours: 6:00 a.m.–4:00 p.m. Monday–Friday, 8:00 a.m.–3:00 p.m. Saturday, 9:00 a.m.–2:00 p.m. Sunday. Bar Hours: 4:00 p.m.–11:00 p.m. Monday–Wednesday, 1:00 p.m.–11:00 p.m. Thursday, 1:00 p.m.–12:30 a.m. Friday, 3:00 p.m.–12:30 a.m. Saturday, 11:00 a.m.–5:00 p.m. Sunday. Snack Bar Hours: 11:00 a.m.–5:00 p.m. Monday–Thursday, 11:00 a.m.–11:00 p.m. Friday, 11:00 a.m.–10:00 p.m. Saturday, 11:00 a.m.–5:00 p.m. Sunday. Breakfast Buffet at the Bayview Restaurant. Welcome Orientation at the Depot Theater. Drill Instructors Brief at the Command Museum. Motivational Run at the Command Museum. Marine Corps 101 at the Depot Theater. Company Commander's Brief at the Depot Theater. Liberty Formation at the Depot Theater. Liberty Lunch at the Bayview Restaurant. Color Ceremony at the Commanding General's Headquarters. Graduation seating at Shepherd Field Parade Deck. Graduation ceremony at Shepherd Field Parade Deck. Lunch Menu Service at the Bayview Restaurant. The phone numbers often change on military base locations. Click here for the contact page for MCRD SD if the phone number listed does ot work.